The Faith, Love, & Joy (FLJ) of SS. 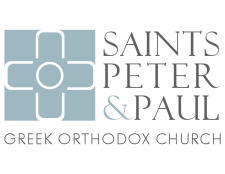 Peter and Paul Greek Orthodox Church aims to be a conduit of the holistic growth of our Elementary Age Children toward Christ and His Church. Our FLJ strives to accomplish this mission by intentional gatherings of Worship, Fellowship, Outreach, and Education. And that’s exactly what we do with our monthly gathering! Parents are welcome to join us to enjoy complimentary pizza & refreshments, and to help lead our activities. Then each of the children’s age groups meets together for the rest of the evening rotating between three activities: gym, making a craft, and a discussion. And I pray that the sharing of your FAITH may promote the knowledge of all the good that is ours in Christ (Philemon 1:6). But the fruit of the Spirit is LOVE, joy, peace, patience, kindness, goodness, faithfulness, gentleness and self-control. Against such things there is no law. (Galatians 5:22-23). And the disciples were filled with JOY and with the Holy Spirit (Acts of the Apostles13:52).